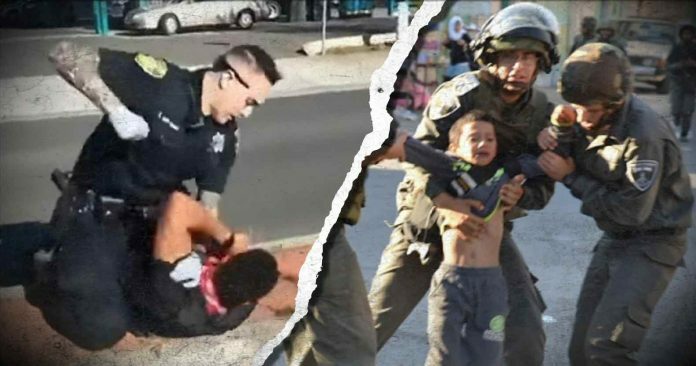 U.S. law enforcement officials regularly travel to Israel to receive extensive training from a military that routinely shoots and kills innocent citizens. As the death toll near the border in Gaza continues to grow, and Israeli military snipers shoot and kill innocent women and children, journalists, and nurses rendering aid to wounded victims, Americans should consider the influence Israeli forces are having on police in the United States, given the extensive training select law enforcement officials receive during seminars in Israel that have been ongoing for years. It may sound like a “conspiracy theory,” but the close relationship between the U.S. and Israel—which costs American taxpayers nearly $4 billion a year—has extended to the training of law enforcement, and dozens of American officials are sent to Israel to train with Israeli law enforcement each year. In September 2017, the Jerusalem Post reported that 52 American police officers from 12 states made a special trip to Israel “to train in counterterrorism techniques and attend an annual 9/11 memorial service outside Jerusalem” with the Police Unity Tour, which was established in 1997. During the trip, the delegation of officers was based at the Beit Shemesh police academy where they participated in counterterrorism drills and received training from Israeli military and police before they concluded on Sept. 11 with a 9/11 memorial service. Police spokesman Micky Rosenfeld told the Post that he believes the “ongoing security threats” in Israel present the perfect situation for officers from around the world to receive training that will shape the way they view their jobs at home. “In terms of counterterrorism tactics that have been used and implemented at numerous scenes across the country, where unfortunately terrorist attacks have taken place, the Israeli police have used those tactics to minimize injuries, as well as find rapid solutions,” Rosenfeld said. 2002 – Los Angeles Police Department Detective Ralph Morten visited Israel to receive training and advice on preparing security arrangements for large public gatherings. 2003 – The U.S. Department of Homeland Security established a special Office of International Affairs to institutionalize the relationship between Israeli and American security officials. 2011 – A delegation of American police commanders, security experts and FBI agents, traveled to Israel for a joint training seminar with Israeli counter-terrorism officials, sponsored by the Anti-Defamation League. 2012 – The New York Police Department opened an Israeli branch at the Sharon District Police Headquarters in the Israeli coastal city of Kfar Saba. 2013 – A special team of bomb squad members from cities along the U.S.-Mexico border traveled to Israel to improve techniques and tactics for dealing with illegal immigration. When David Grosso, a city council member in Washington D.C., learned that D.C. Metropolitan Police Commander Morgan Kane was a member of the 2017 trip, he wrote a letter to the department’s chief of police arguing that no matter where the training was taking place, the last thing the U.S. needs is more militarization among local police when what is actually needed is a community-based approach. Given the fact that police in the United States already have easy access to military equipment—in fact, a police department with only eight officers obtained $3 million worth of military vehicles, weapons, and equipment—the idea that departments are receiving extensive military training should raise major red flags.